Nursery design is such an important part of the new parents’ home. This room needs to create a soothing environment for sleep, be comfortable for parents while feeding and playing with their baby, and be safe and fun for the child as he or she grows. We’ve rounded up some of our favorite ideas for nursery window treatments. Whether your nursery plan is all neutrals or awash with bright colors, The Shade Store has hundreds of material options to choose from. In the photo above featured in Apartment Therapy, the parents opted for a simple nursery that could grow with their child as their tastes evolved. Designers Kiera Kushlan and Jessica Centella of Washington, D.C.-based Residents Understood designed a clean color scheme with grown up accents like an oriental rug. White walls and Flat Roman Shades in a neutral gray are a timeless combination that could just as easily work in a high schooler’s room as a nursery. 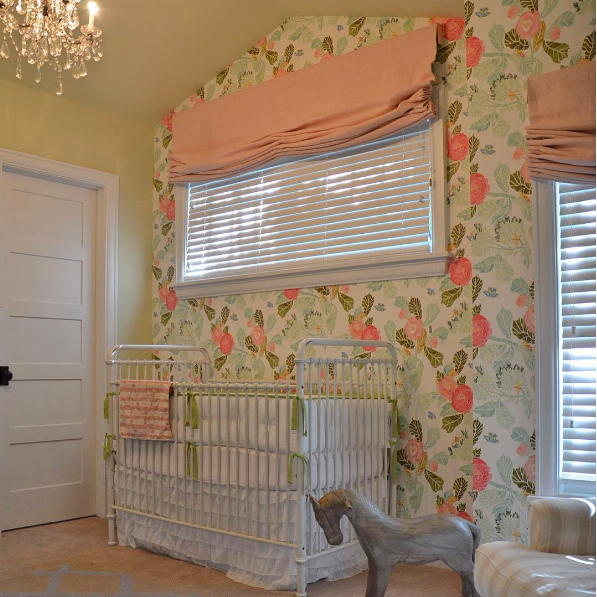 In the photo above from Pamela Chelle Interior Design, the Relaxed Roman Shades pick up on the pink from the adorable floral wallpaper. The fabric shades softens the wood blinds and geometric lines of the crib. We also offer a multitude of prints in hues of pink and blue, yellow and green, and every color in between. If you’re still shopping for your nursery décor, order a few (or a lot!) of our free swatches to coordinate your window treatment fabric with the rest of the room. Most new parents would say that they need all the help encouraging their newborns to sleep that they can get. Blackout shades can help block evening and morning sun, hopefully allowing baby to sleep a little longer. Blackout linings can be added to Roman Shades, and blackout material options are available for Roller Shades, Pleated Shades, and Cellular Shades. In the photo below, interior designer Regan Baker opted for Flat Roman Shades with a custom matching Valance. If your nursery windows tend to be drafty, blackout shades and linings reduce drafts and can assist in maintaining an even temperature in the summer and the winter. 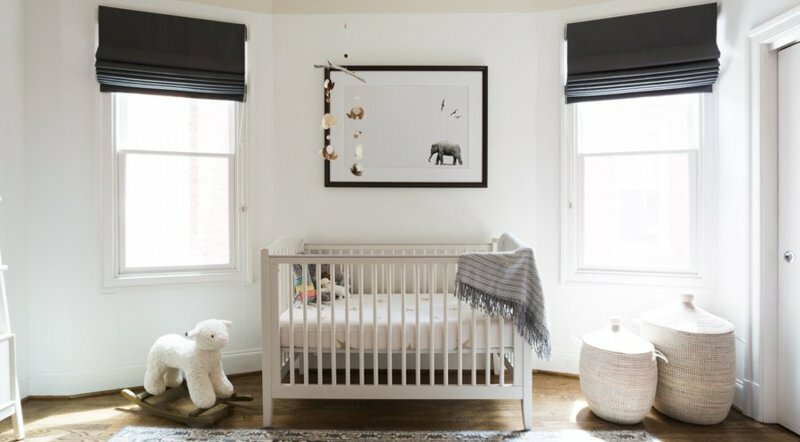 We have curated a selection of our Blackout Roller Shades, Drapery, and Roman Shades specifically with your kids in mind. Our Kids Collection includes new designs with butterflies, bohemian floral prints, skyscrapers, safari animals, and airplanes, as well as some of our most versatile and popular materials. Designing your child’s playroom or nursery has never been easier! Shop the collection here. When installing window treatments that will be around children, safety is the number one priority. Dangling cords can be dangerous. We recommend cordless shades for nurseries and children’s bedrooms, and our cordless options have been certified Best For Kids by a third party lab recognized by the Window Covering Manufacturers Association (WCMA). If you have any questions about new window treatments for your nursery, feel free to get in touch with us: stop in a showroom near you, call us at 800.754.1455, or email us at design@theshadestore.com. Our Design Consultants are ready and waiting to help.